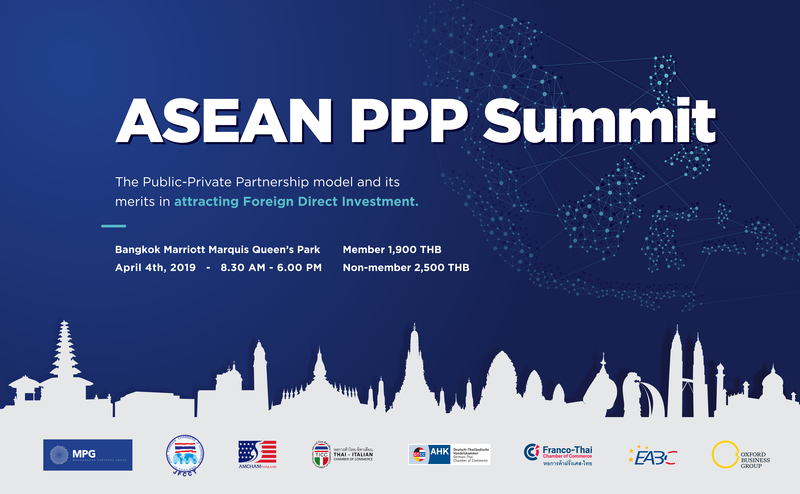 The Mahanakorn Partners Group (MPG) is delighted to announce that the 2019 edition of the ASEAN PPP Summit: The Public-Private Partnership Model and its Merits in Attracting Foreign Direct Investments, the leading regional forum on infrastructure investment in Southeast Asia, will be held in Bangkok Marriott Marquis Queen’s Park, Thailand, on the 4th of April 2019. The event, conceived by MPG and supported by foreign Embassies and Chambers of Commerce in Thailand, will be attended by international investors and professionals, with the aim of attracting Foreign Direct Investment and fostering business opportunities in ASEAN. The ASEAN PPP Summit will feature several informative keynote speeches and panel discussions by dignitaries, including ministers of the Royal Thai Government and other ASEAN member states, as well as global business leaders. The annual Summit, which gathers ASEAN government officials, eminent international investors and C-Level professionals from around the world, provides a high-level platform for sharing knowledge and fostering business opportunities. The annual event, an initiative of MPG supported by the European Association for Business and Commerce (EABC) and the European Union, is organized in cooperation with major European Chambers of Commerce in Thailand, including the Thai-Italian Chamber of Commerce (TICC), the French-Thai and the German-Thai Chamber of Commerce, alongside the American Chamber of Commerce in Thailand (AMCHAM), and Joint Foreign Chambers of Commerce in Thailand (JFCCT). In light of the fact that Thailand will assume ASEAN chairmanship in 2019, we will be honored by the presence of the Thai Prime Minister, who will deliver this year’s opening address. Topics will include legal frameworks and financial structures undergirding PPP projects, policies on foreign direct investment and various, recent amendments aimed at making FDIs more attractive in terms of cost and time-efficiency, critical insurance coverage for PPPs and issues that investors encounter in the ASEAN marketplace for structured trade credit and political risk insurance products. Examples of successful projects will also be highlighted. Sponsorship opportunities are available for organizations wishing to increase their visibility, share information on their projects or be considered for future opportunities.